Before we start working on the wiring, we must define the boundary of the PCB. This boundary is created by drawing a box in a special layer of the PCB, the edge cuts layer. 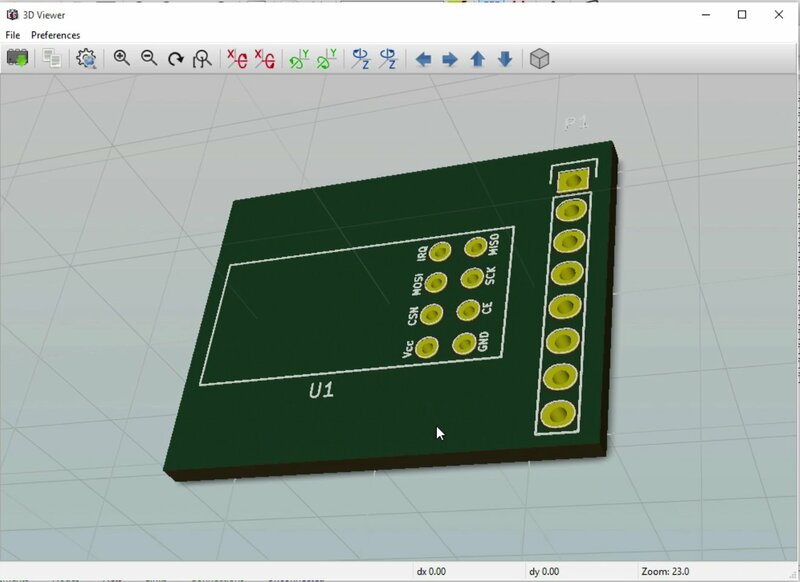 The Edge Cuts layer is one of several PCB layers available in Kicad. It is the one where the boundary of the PCB is defined. 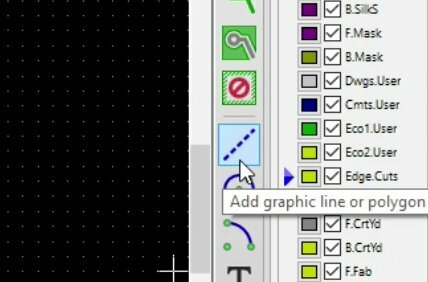 To do that, start by selecting the Edge.Cuts layer from the Layer chooser on the right side of the Pcbnew window. There are many other layers available, some of which we will use later. We will use the Polygon tool to draw the boundary of the PCB. Once you have selected the Edge.Cuts layer, click on the add graphic line or polygon button. 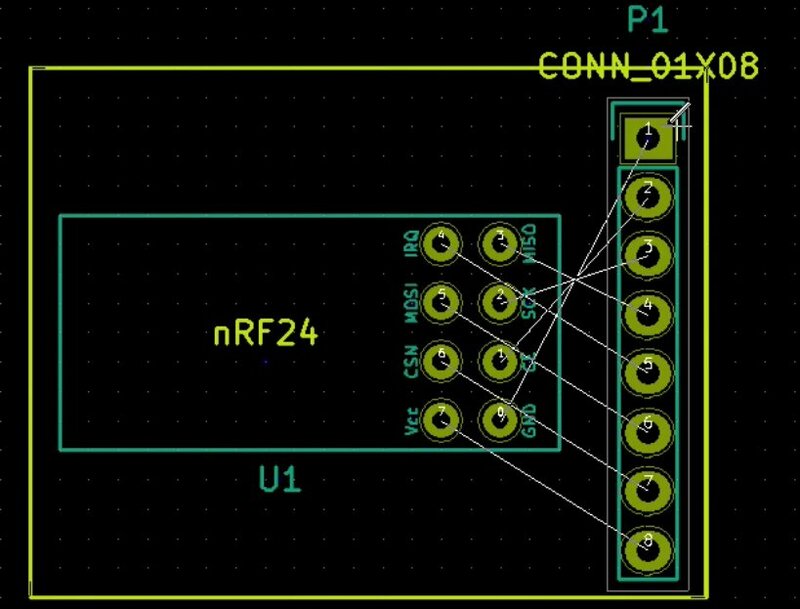 You can choose other types of graphics or graphic elements but for the task at hand we will the polygon to create the boundary box around our PCB. To make the drawing easier and more precise, just like in EEschema, you can choose to change the size of the grid. 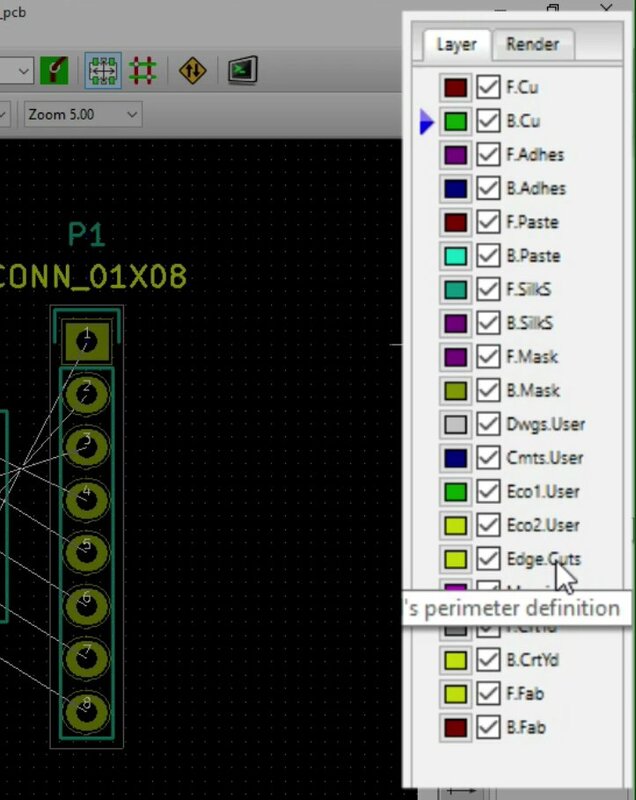 The grid setting in Pcbnew. Decrease it to make drawing more accurate. At the moment, the grid is set to 0.635 millimeters. For this drawing, I suggest a setting of 0.127. To start drawing, with the polygon tool selected, click just outside at the top right corner of the straight connector. This will start drawing a line. 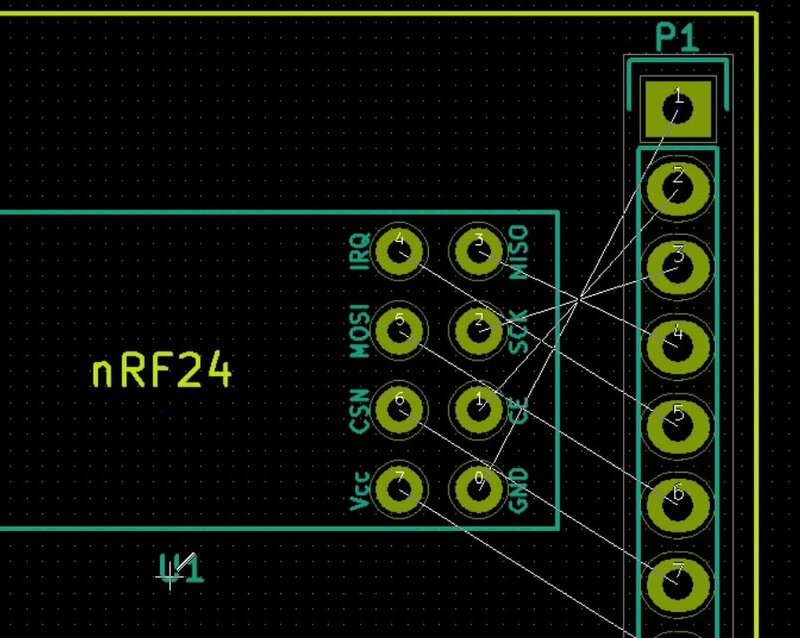 Move the cursor horizontally towards the left, until it is over the top left corner of the nRF24 footprint, and click again to mark the left top edge of the box. The first line of the boundary box. Continue in a similar way to close the box. Move the mouse down towards the bottom left corner of the nRF24 footprint, and click to define the third edge of the box. Then move towards the left, horizontally, until you reach just outside the right bottom corner of the straight connector, and click to define the third edge. Finally, move the mouse cursor over the first edge and double-click to close the polygon. This box defines how big your PCB is going to be. 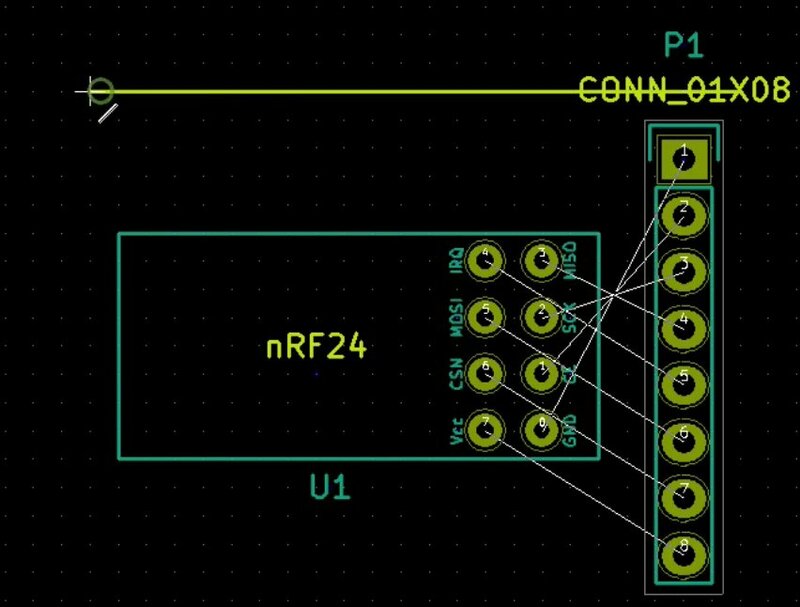 One thing to notice is that you can measure lengths in KiCad very easily. Distances between points on the PCB or the top-right corner of the canvas are shown in the status bar. You can see, in the status bar of the Pcbnew window, the distance measurements. These are dimensions for X and Y axis. If you want to know for example, how long this side of my PCB is, move the cursor to one end, press the space bar to zero the measurement and then move across to the other side. The distance will be shown in the status bar. How does our PCB look like now? Let’s have a look. We will use the 3D Viewer for this. 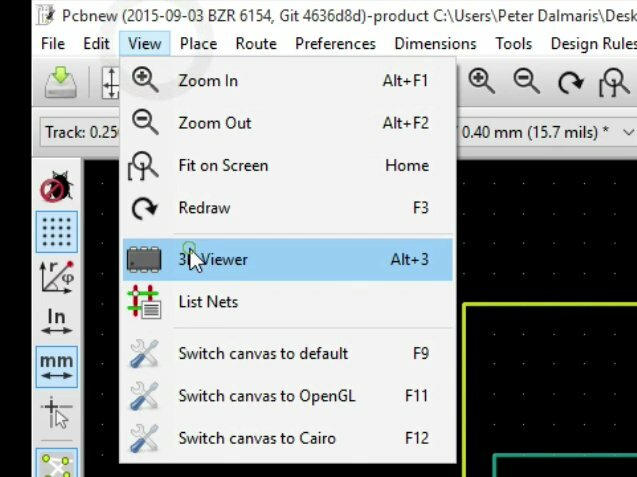 To access the 3D Viewer, go to the View menu and click on 3D Viewer. A 3D view of the PCB. The wiring is not done at the moment. Close the 3D Viewer, and let’s work on the text labels. 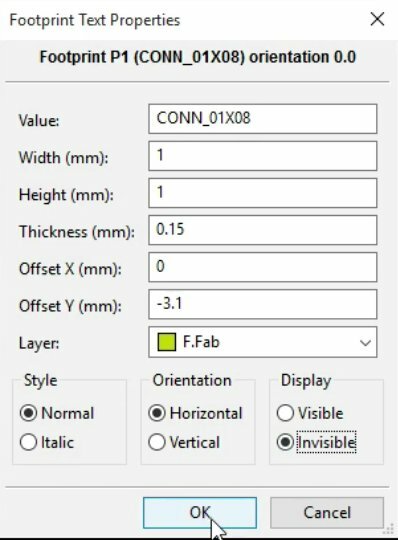 If there is a text label that you prefer not to show in the final printed PCB, you can mark is as “invisible”. For example, the “CONN_01x08” label can be made invisible. To mark it as such, put your mouse over it and hit the E key to edit it. To make a label invisible, go to its properties and click on the “Invisible” radio button. Click on the “Invisible” radio button, hit OK, and this label will now not show in the final printed PCB. Change the grid into something smaller, and edit the properties of the label to make its dimensions smaller if needed, so that it can fit in the space available. Do the same for same thing for U1. In the next chapter, we will do the wiring.